If you’ve been following along for a while, you know that I love making Halloween costumes. Maybe I should have went into costume design, but instead I just get to have a blast every October making my kids costume dreams come true. Okay, maybe that’s a little bit extreme, however, my kids always love their new costumes. 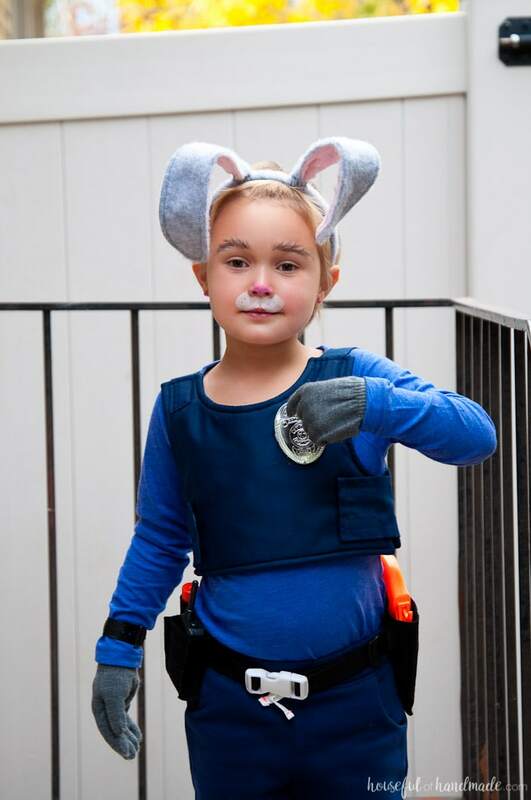 I had to pry my daughter out of her new Officer Judy Hopps Halloween costume after I took these pictures. I’m hoping it can at least stay kinda clean for Halloween. One of the reasons I love to make my own costumes, is they last so much longer than the thin, cheap material most Halloween costumes are made out of. I know they only really need to be good for one night (or a few because there are always lots of events you need to dress up for in October), but my kids want to wear them over and over and over. Our dress up wardrobe is full of old Halloween costumes and they love it! When making homemade kid’s halloween costumes, I tend to use 2 types of fabric a lot: felt and broadcloth. Felt is great for complicated pieces that would be a pain to hem. 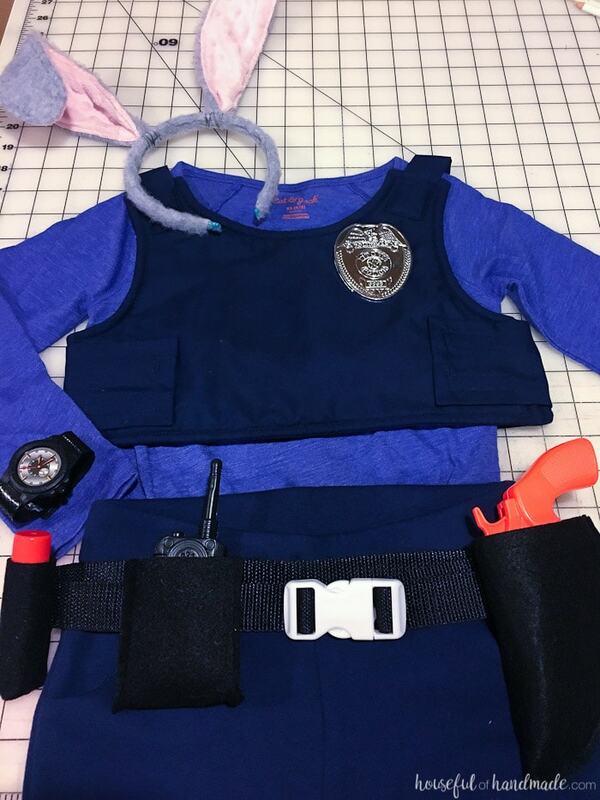 It also is holds together well with hot glue so you can make things like this Officer Hopps utility belt. And felt can be bought by the yard (not just in those little squares at the craft store) and is super cost effective. I only ended up using the felt in the utility belt this year, but for last year’s Sharkboy and Lavagirl Halloween costumes I used it a lot. This year I relied on broadcloth more than felt. Broadcloth is a basic woven cotton that is usually less than $5 a yard and comes in loads of solid colors. Halloween costumes that are sewn together out of broadcloth wash well and last much longer than the costumes in the store made of cheap satin and knits. I made a Super Why cape for my son when he was 2 (so 5 Halloweens ago) and it still looks amazing and is well loved because who doesn’t love a cape. When my daughter told me she wanted an Officer Judy Hopps Halloween costume this year, I jumped on the idea! 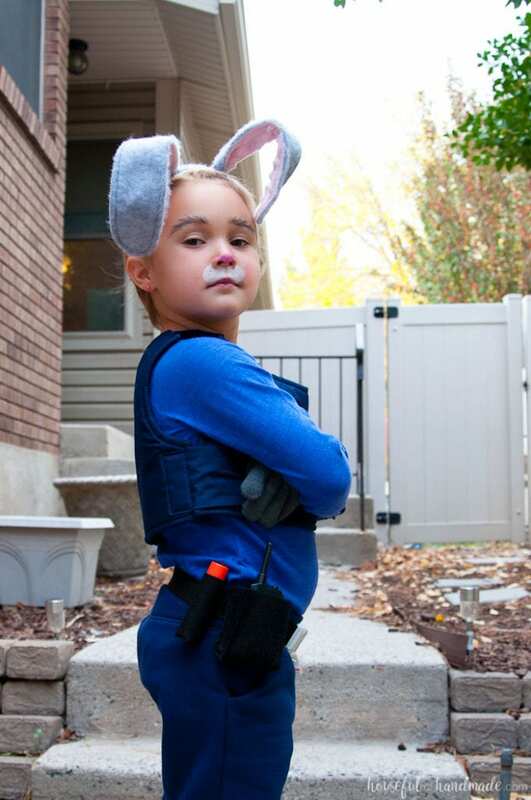 How could I not want my daughter to be a strong willed little bunny who wants to change the world? I loved the movie Zootopia so much (which is good cause we have watched it many, many times). It was such a blast making this costume and my daughter couldn’t be happier (especially with her Fox Away). FABRIC: The amount depends on the size of your child, make the pattern for the vest first and then decide how much fabric you need. Start by making your pattern. 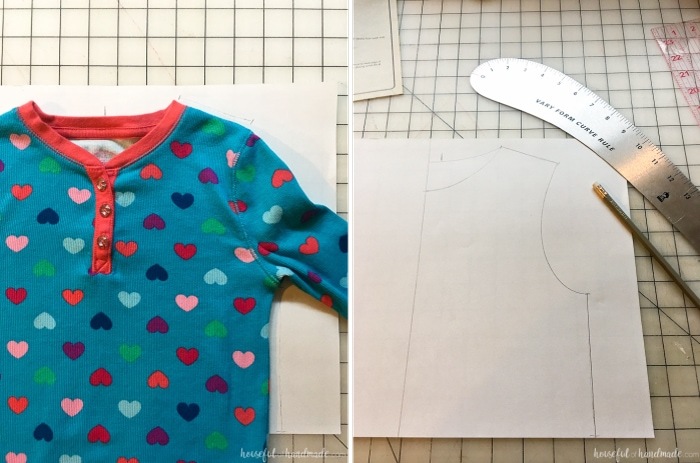 Use a t-shirt and lay it out on a piece of paper. 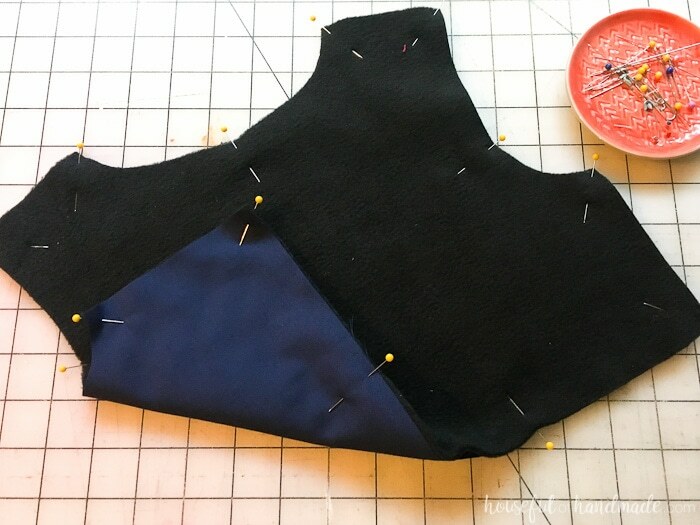 Mark the center back, trace a line across the shoulder seam, and trace a line along the side seam from under the arm to the length you want your vest. I just went to the bottom of my paper, nothing too exact needed. Take the shirt off your paper and draw curves for your neck and arm hole. I use my french curve for this, but you can just freehand them too. 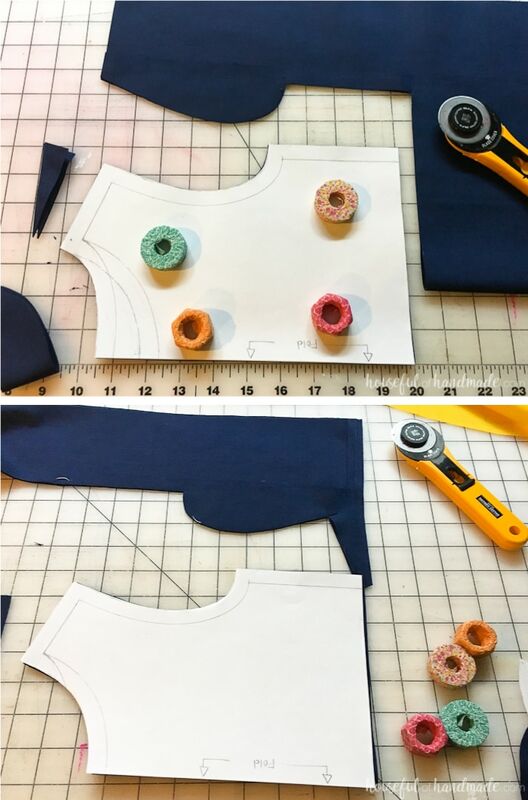 Make a lower scoop neckline for the front. You can mark the front and back neck on the same paper, just make sure you cut the back first. Add your seam allowance (I used a 1/2 inch seam allowance). Then cut 2 of the front and 2 of the back. Also cut 1 of the front and 1 of the back from fleece. Pin the 3 front pieces together, with the 2 broadcloth pieces touching, right sides together, and the fleece on top. 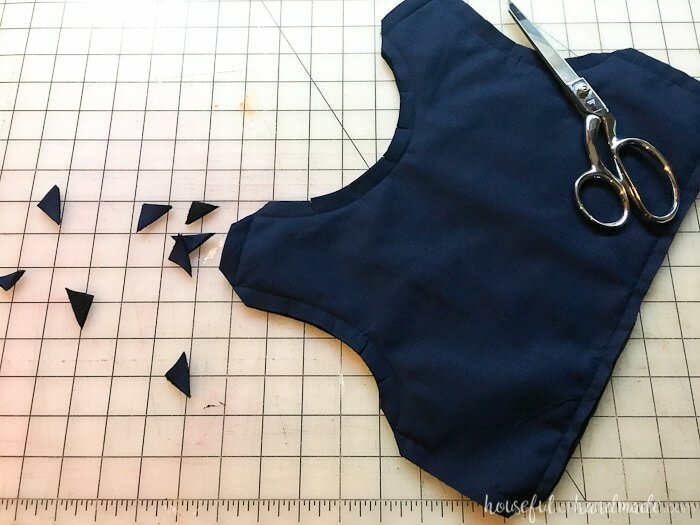 Sew around the entire perimeter of the vest, leaving a 3-4 inch opening in one of the sides. Clip all the corners and notch the curves. 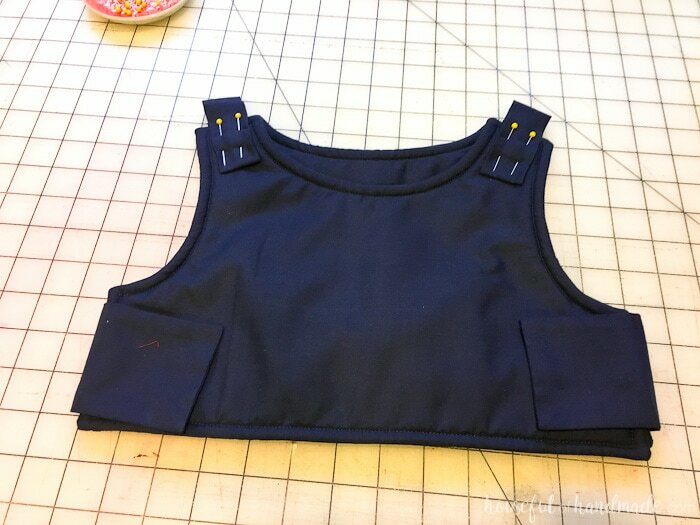 Then turn the vest right sides out so the fleece ends up between the two pieces of navy broadcloth. Iron the seams so they lay flat and top stitch around the entire perimeter 1/4″ from the edge. This will close up the opening you left to turn the vest. Repeat on the other vest piece. 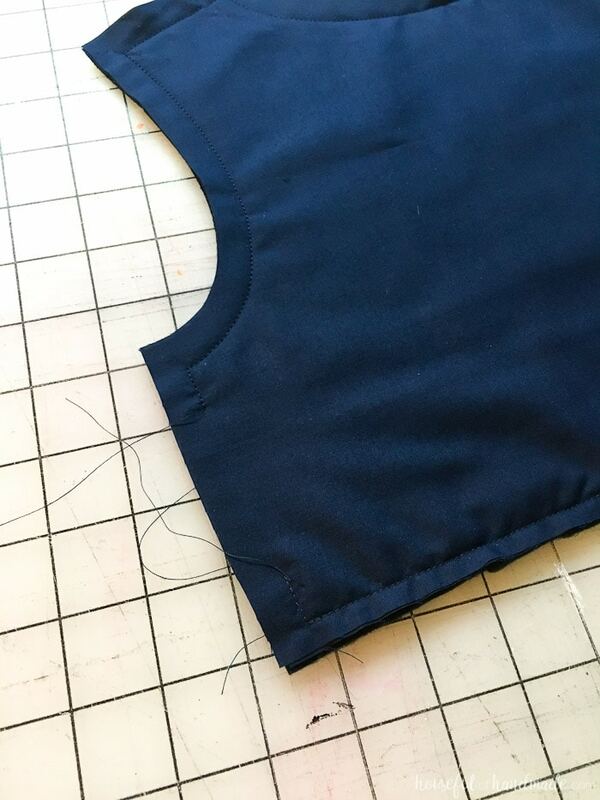 Now make a couple fabric tubes by cutting a piece of fabric double the width of the shoulder seam and long enough to be attached a couple inches on the front and back of the vest. Fold it in half and sew down the open side. Turn it and iron flat. 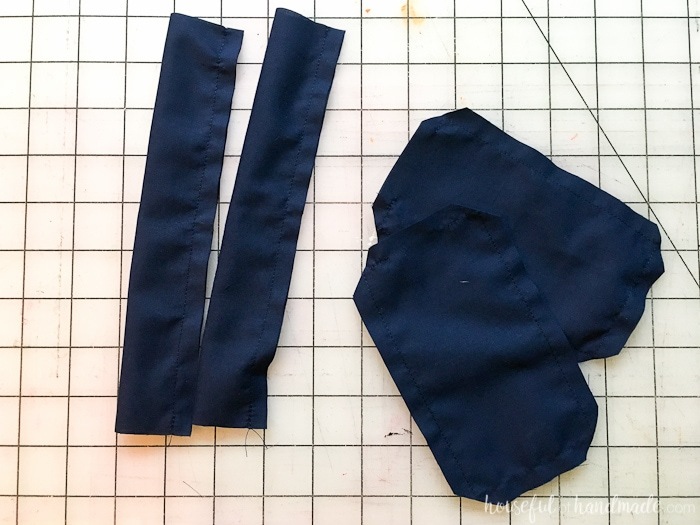 Then cut 4 pieces of fabric the width of the side seam and long enough to be attached a couple inches on the front and back of the vest sides. 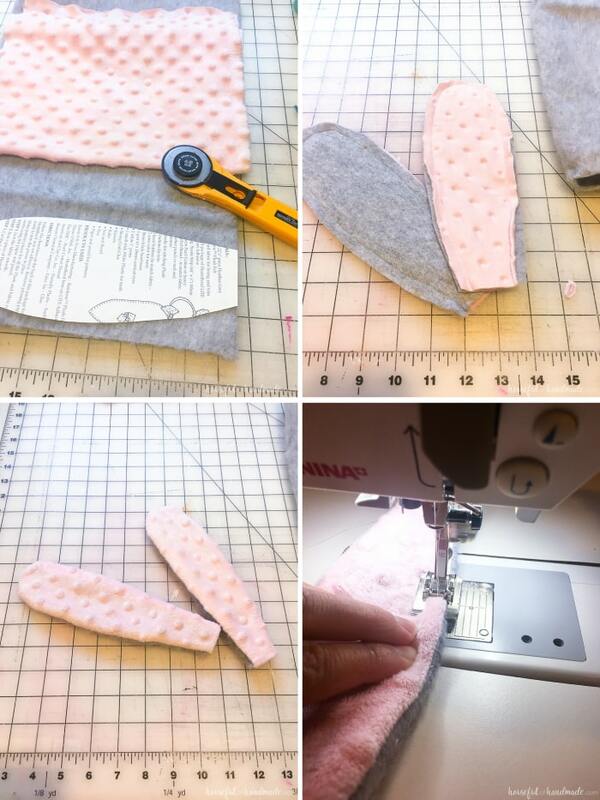 Sew around the perimeter, leaving a 2 inch opening on one side. Turn it right sides out and press flat. 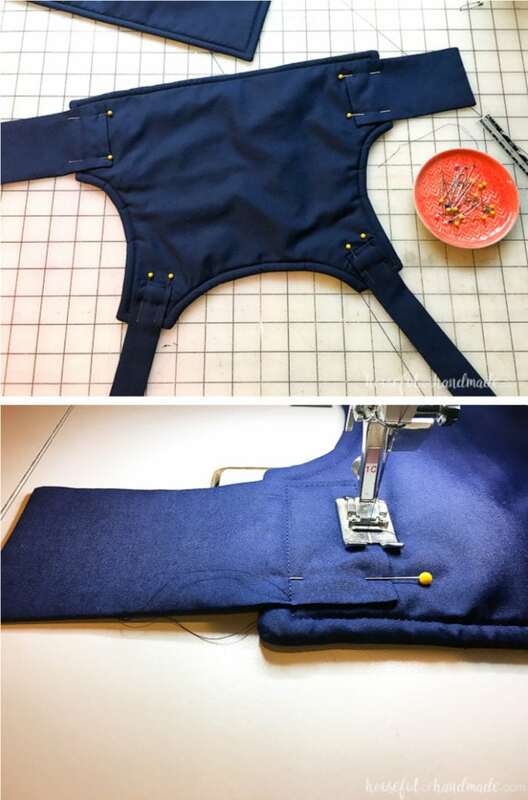 Attach the vest straps to the back of the vest by sewing around the straps in a rectangle. 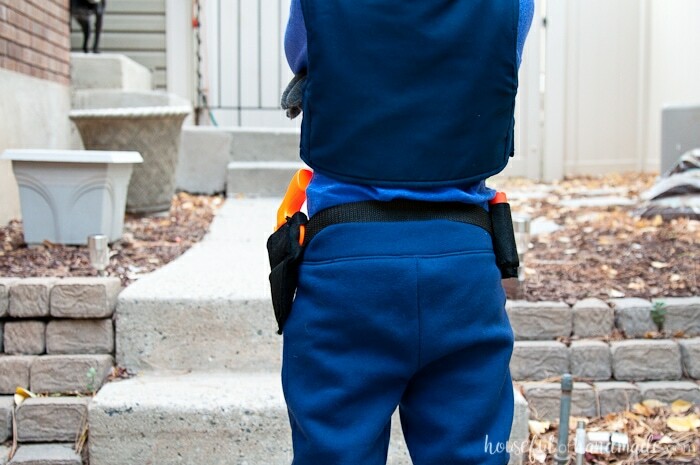 After making sure the vest will fit over your child’s head, secure the shoulder straps to the front of the vest. Then use velcro to secure the side straps so they can be opened to get the vest on and off. 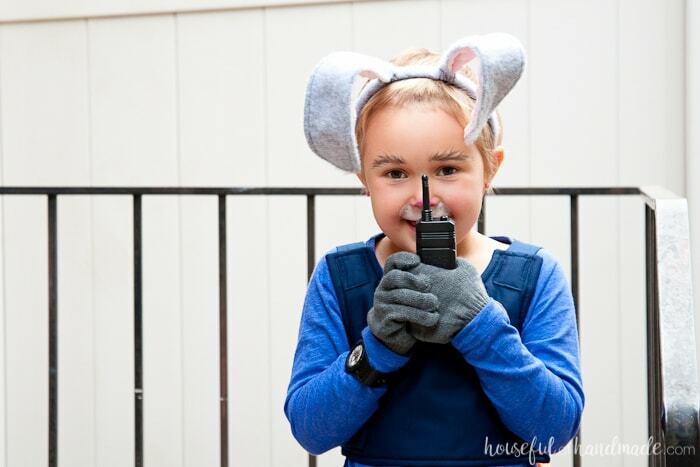 If the vest will not fit over your child’s head, you can use velcro on one shoulder strap and one side strap instead. Now all that is left is to pin a policer officer badge to the front of the vest and get ready for duty! Make a pattern on a piece of paper. My ears are 2 1/2 inches wide at the top widest part and 9 inches wide at the bottom. Cut two of the ears out of faux fur and 2 out of the pink fluffy material. Sew the two pieces together around the perimeter, leaving the bottom open. Turn the ears and topstitch around the edge. Now I would recommend adding a little craft wire to the ears to hold them up, but I thought they would stay up okay without wire, they do not. I think I am going to take the ears off and redo them with wire. I am planning on looping the wire around the perimeter of the ears and then leaving some out of the bottom to wrap around the headband. Fold a pleat into the bottom of the ears and sew to secure. Glue the ears to the top of the headband with hot glue. 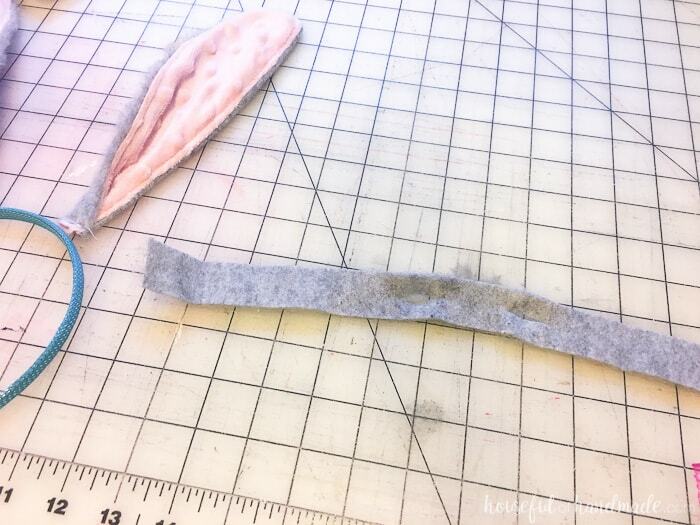 Cut a piece of faux fur the length of the headband and put a couple little holes in it to feed the ears through. Glue the fur over the headband, then wrap the remaining fur around the edges and secure with glue. 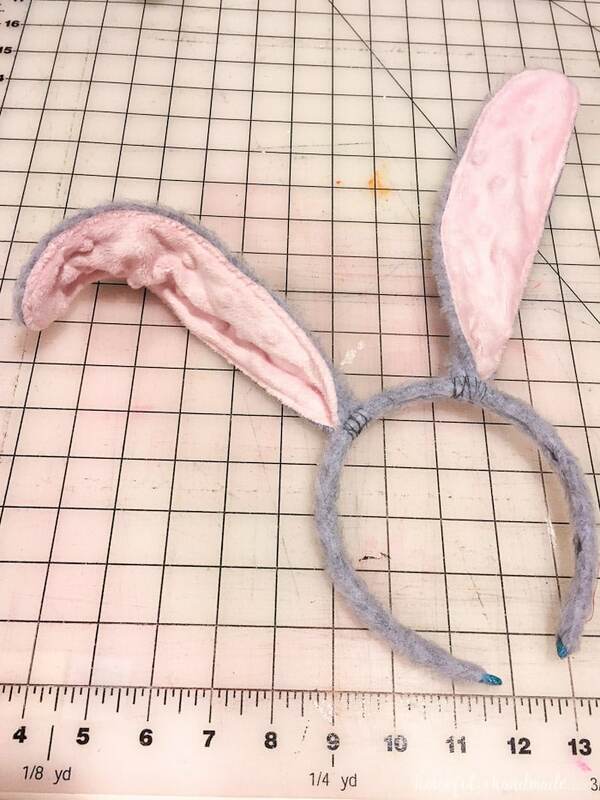 To secure the ears a bit more and hope to get them to stand up, I hand sewed the ears onto the headband too. My daughter was super excited to wear her ears and hop around. I can’t wait for Halloween! 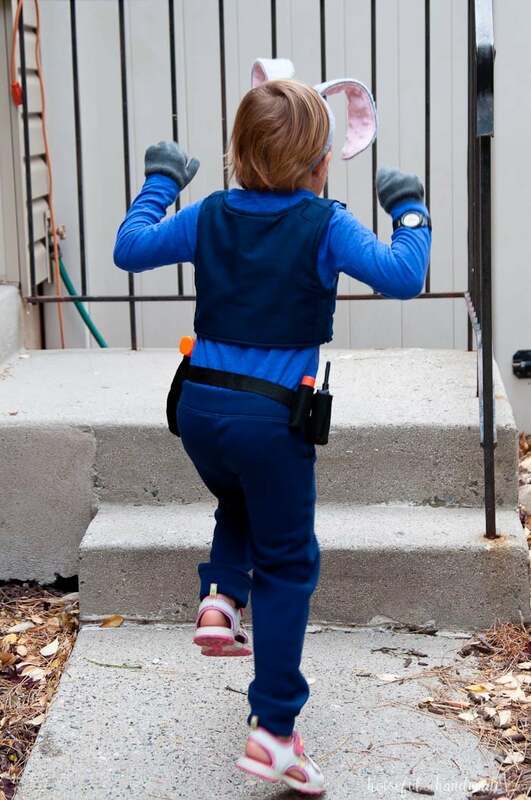 The final piece of the costume is Office Hopps utility belt. She needs a place for her Fox Away fox repellant to keep her safe in Zootopia. Cut a piece of black strapping about 6 inches bigger than your child’s waist. Put one side of the buckle on it. 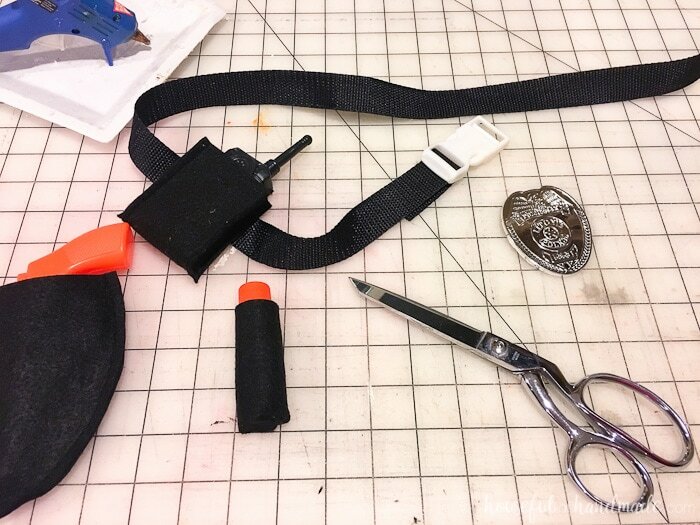 Make the pouches to hold your cop tools with the black felt. Cut two slits in the back of each pouch the size of the strapping and then slide the pouches onto the belt over the side that doesn’t have the buckle on it yet. Once all your pouches are on, secure the other side of the buckle. Clip it around your waist and load it up. 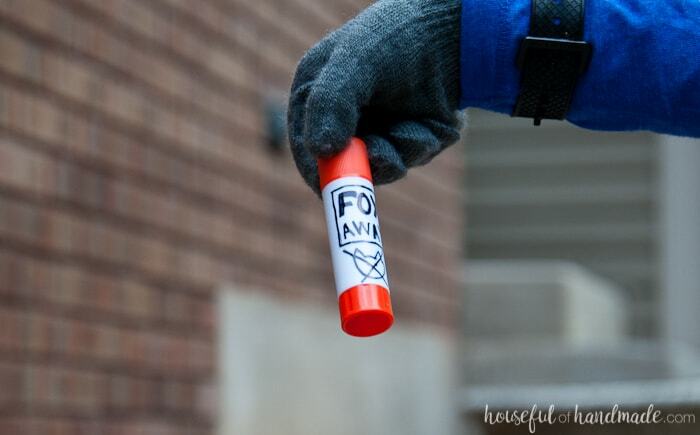 To make the Fox Away, take the label off a glue stick and decorate it with a sharpie. Easy peasy! Now all that was left was to add a bit of face paint to give her a cute little bunny nose. Also, we grabbed a pair of gray gloves, you never know if it will be in the 70s or snowing on Halloween in Utah so I always plan for the worse. And she loves the bunny fingers. 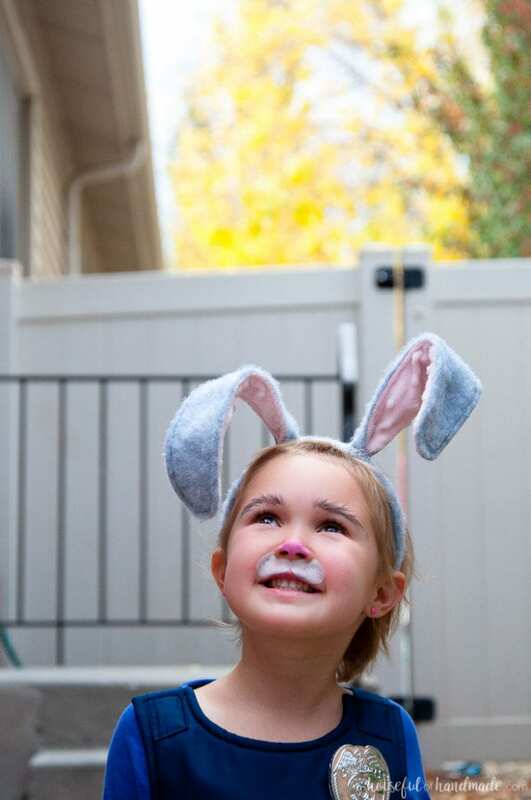 And now this little bunny is ready to hop off to make the world a better place. I love this costume! so so cute! 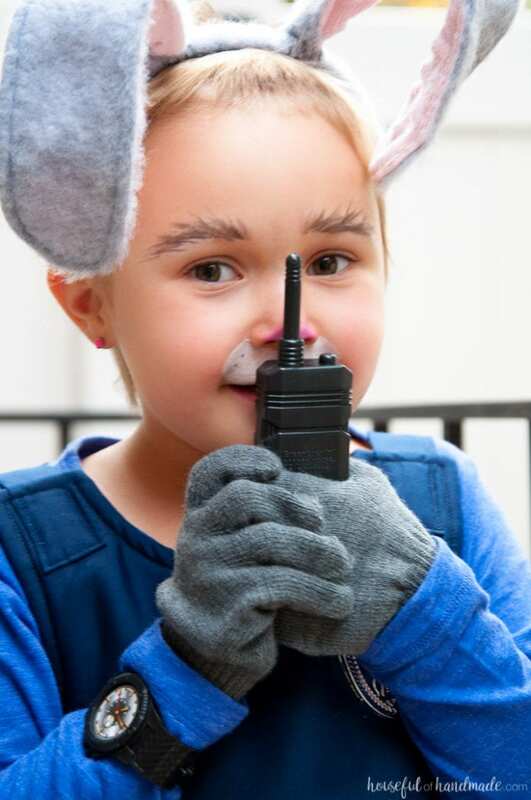 My daughter wants to be Judy so bad! but unfortunately I cant sew to save my life. lol Please tell me you have an Etsy shop and I can buy this vest!?!? So sorry Amanda but I do not have an Etsy shop. Maybe you can find someone local to do the sewing. It really is an easy project. This is the cutest! My daughter would love this! We loved the movie so much. Thanks Emily! We are huge fans of the movie too. Such a good one! OMG! This is amazing!! I was proud of the no-sew donut pillow costume that I threw together for my baby, but this is so much more impressive!! 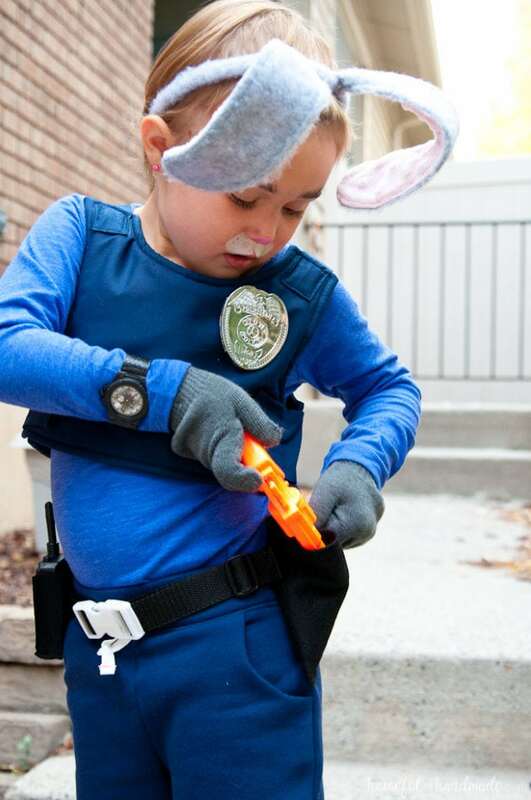 Zootopia is the cutest movie – what a great costume idea! She looks so happy! 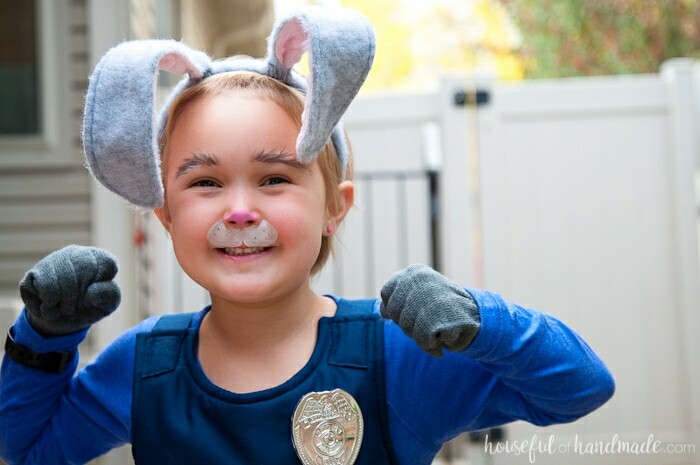 Homemade costumes are the best, and this is seriously adorable! Your daughter is so pretty, what a little actress… You are very talented with sewing. You are CRAZY talented! I took costuming in college but I never mastered sewing, or came even close. 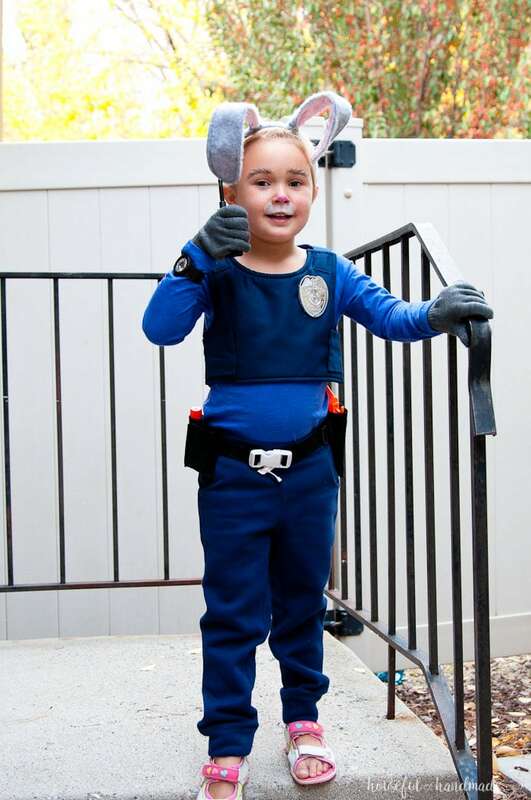 LOVE this costume, and your kids are going to love these costumes for years. Thanks Megan! Costuming would be such a fun class, I wish I would have taken it, but instead I just get to have fun making my kids costumes. Oh my goodness, this is TOO cute! I absolutely love it! So cute! It came out great and she looks so happy! She is definitely happy. Thank you. This is so cute!! 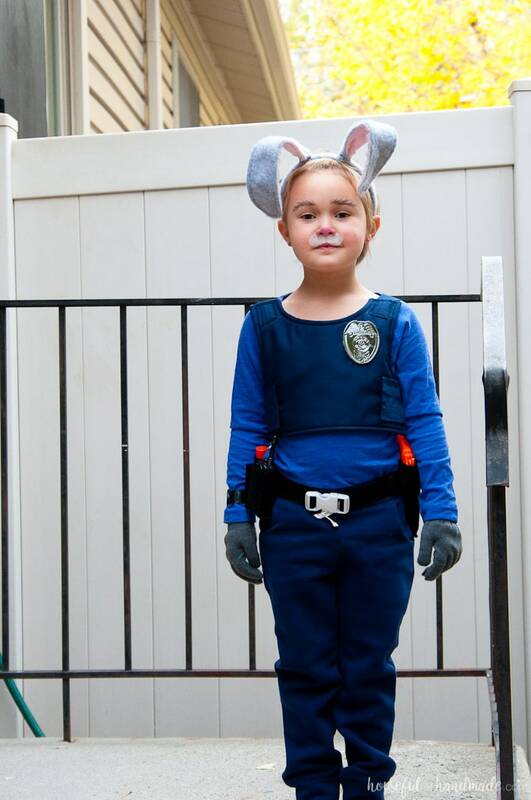 My daughter is a very tall 9 year old and I had such a hard time finding a Judy Hopps costume that fit her! 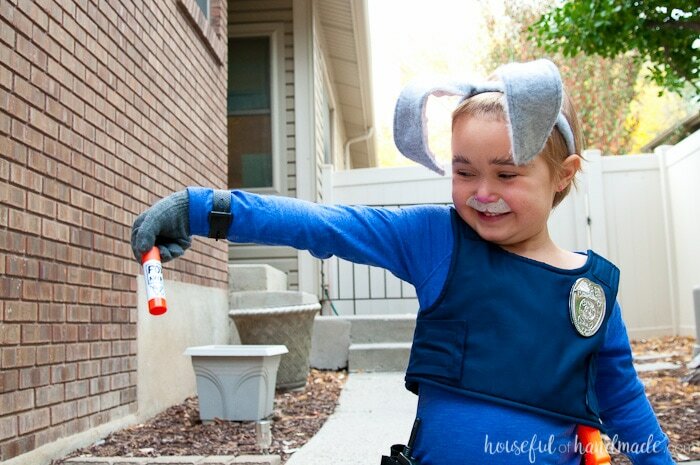 Her and my husband are going as Judy and Nick. I wish I could sew. Oh well, pinning this – adorable! Oh how fun. I really wish she had a Nick, but not this year. This costume is AMAZING! I love Zootopia as well and you did such a great job! Love the little fox away! Thank you Haley! I could watch Zootopia over and over (and have). It’s so much fun and was happy to make this fun costume.